To call attention to a brand category no one ever thinks of, door locks, Indianapolis-based ad agency Young & Laramore, from June 23 - 27 held the first-ever Schlage "Key to Strong Challenge," locking a man in a tiny house in downtown Seattle and sending residents on a physical and digital scavenger hunt to track down the key to unlock him for a chance to win a $5,000 Grand Prize. The event, which is part of a larger campaign which includes TV that launched last month, garnered some hefty exposure for Schlage and, we are told, fueling double-digit sales growth in stores. The Schlage "Key to Strong Challenge" started with a tiny house - 174 sq. ft - located at the Westlake Center Plaza. 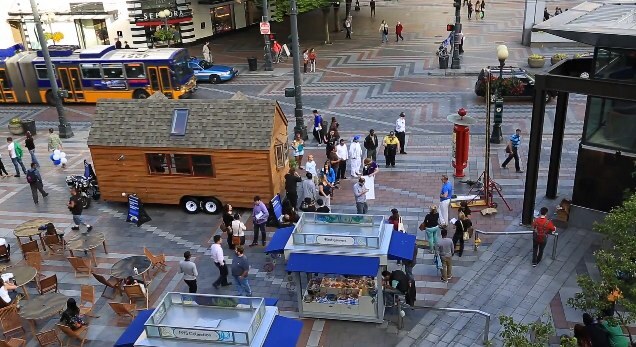 Y&L put out a regional ad and more than 120 Seattle residents responded offering to be locked in the tiny house. The agency ultimately locked up Seattle resident and improv performer Joshua Paul Downs inside the house. Over the course of the five-day event, a total of 14 clues were released on KeyToStrong.com and tweeted by Joshua via @LockedInAHouse while participants used Joshua as a resource via phone, text or tweet. To reinforce the strength of Schlage locks, the Challenge sent participants to a variety of "strong" locations spanning 10 miles across the metro Seattle area in search of clues. Locations included a Schlage product display at Home Depot and the local Starbucks for a "strong" cup of coffee. The first person to find the hidden "Schlage Key" and unlock Joshua from the house received a $5,000 Grand Prize. In addition, five first-place and five second-place prizes were awarded. The Schlage "Key to Strong Challenge" worked quite well and resultewd in a 38 percent increase in web traffic in Seattle, making it the #1 market to refer traffic to the brand's website. Check out the case study video below.